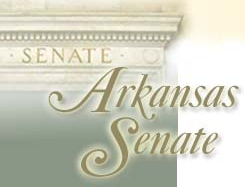 A proposal for an Arkansas Evaluation Center was presented to the Arkansas Legislature on March 19, 2007. The proposal was prepared and presented by the Minority Initiative Subrecipient Grant Office and Dr. Fetterman's Empowerment Evaluation Team. 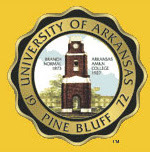 The Center will be housed in the School of Education at the University of Arkansas, Pine Bluff. Dr. David Fetterman is the Director of the Center and Ms. Linda Delaney is the Associate Director. The idea emerged from the MISRGO evaluation tobacco prevention work. The need for more evaluators and more systematic evaluation training throughout the State became increasingly evident during the project. Not only are more evaluators needed for tobacco prevention work but for many other programs as well. This was the impetus for the proposal to establish a center to train new evaluators and provide professional development training for working practitioners. increasing the use of data to inform program operation and decision making. An empowerment evaluation approach and philosophy has been adopted by the Center to shape practice in communities throughout the State. Empowerment evaluation and other collaborative forms of evaluation are particularly useful in complex collaborative endeavors requiring the participation of diverse groups. 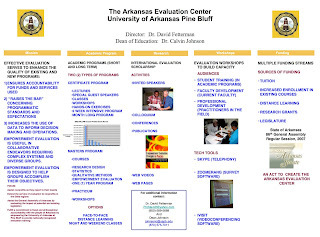 It is designed to help groups accomplish their objectives using evaluation concepts and tools. Special thanks are due to all of the MISRGO staff, grantees, and evaluators for helping to identify this need and transform this need into an action step designed to meet the need.